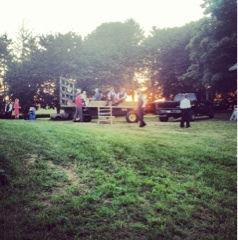 Last evening, we attended our lovely friends' magical outdoor barn wedding. 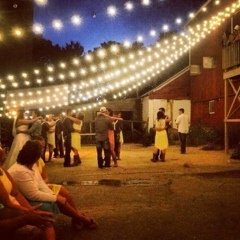 It was the most fun I've ever had at a wedding in a long time. As we arrived at the address, a young lad, clad in blue jeans, pointed down the road and directed us to where to park in his Dutch accent. "It's jusht a mile don the road," he said. 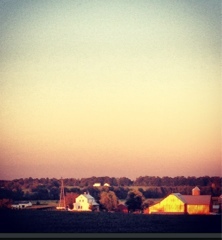 Once there we were swept away atop a hay wagon pulled behind a pickup as we held on for our dear lives. I must say, it set the tone for the night as you could sense this will be one fun wedding. 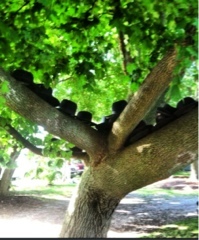 This tree served it's purpose in more ways the one, as it held the Amish men's hats. 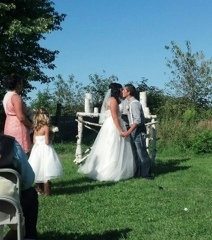 We were whisked away to our hay-bale seats for the outdoor ceremony. 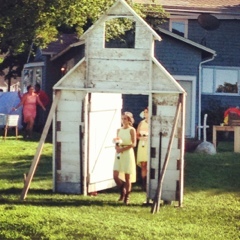 Soon, the bridesmaids made their appearances through this old barn door entrance. 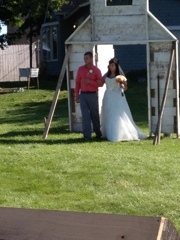 Couldn't have been a more perfect day as the sun shone down on us. We fanned ourselves with our programs that had handles that served as a fan. 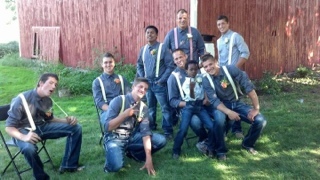 So many cute kids at this wedding. 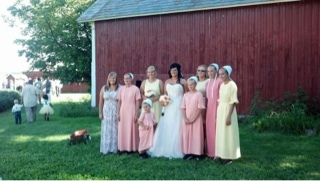 The bride and groom were both raised Amish, so most of the guests attending were Amish. 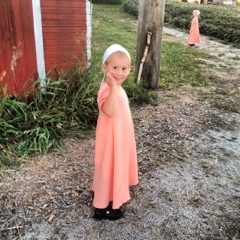 This was one of the bride's nieces. 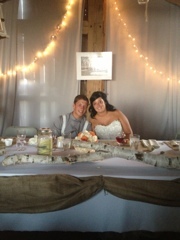 Here is me with the hubs. I was soaking up every ray of the sun and all the adorable details that went into this wedding. Loved every part as we met up with my crazy-fun friend Kathy. 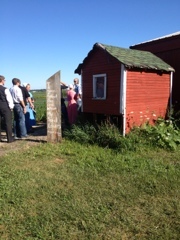 As we wound around he barn, we heard some hokie-pokie music coming from the barn yard. 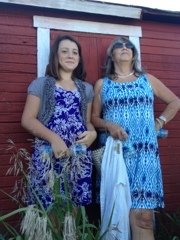 Syd kept saying, "This is the coolest wedding ever." 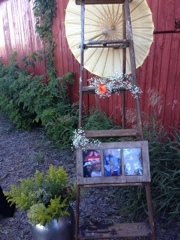 This was on the pathway around the barn to the reception. 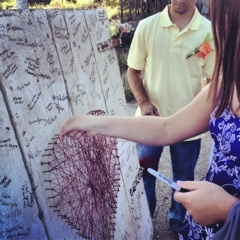 Here, we signed our names on an old barn door then wound the string around the next nail as we thought a prayer for the couple's new journey. I counted five windmills in the oasis of the amazing country-living setting we were settled into. 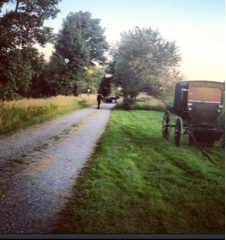 As I checked in on my social media, it said my location was in Amish Paradise. I truly felt like I was in a set of a movie, indeed. This adorable little girl came right up to us as we were hanging out in the barn yard. 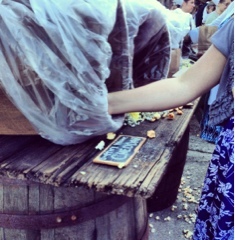 ...where they had a popcorn bar served in old whiskey barrels. You quenched your thirst with fresh mint tea and lemonade. This was also where they served the food and, later, it served as a dance floor. 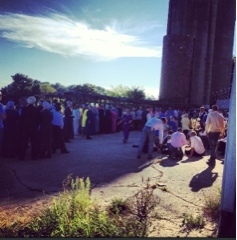 Talk about an Amish Barn Dance! This is about as close as you get. Okay, I'm sorry, but I'm going to us the word LOVE again. 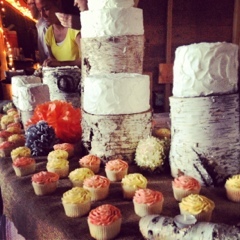 I loved the birch tree cake holders. 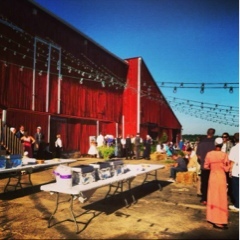 We heaped our plates with delicious Amish-style food in the barnyard area and made our way up the steps to sit in the historic old barn loft. 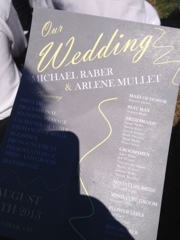 What a stunning couple Mike and Arlene made! I grew up with Arlene's family, and she comes from a large family of 15 children. 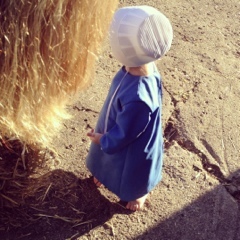 Her Mom is one of the most amazing Amish ladies I know. She's a friend of mine who is loved by many. She has such a good heart. 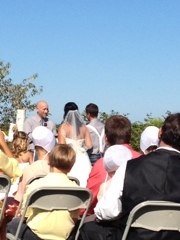 That's her to the right of the bride. What a fun group of guys. Arlene with her sisters. What a good-looking bunch! as much as we did. 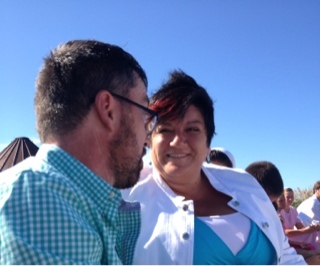 So many beautiful people in the perfect setting for a celebration of LOVE:). 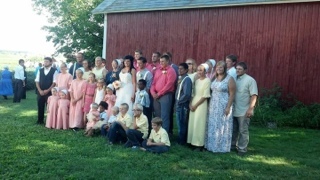 As we made our way back home, we felt blessed to have been invited to this country wedding. Thank you, Mike and Arlene, for the fun evening. My advice for your future is Communicate, Pray Together, and Stay Friends! In fact, that would be my advice for EVERYONE!